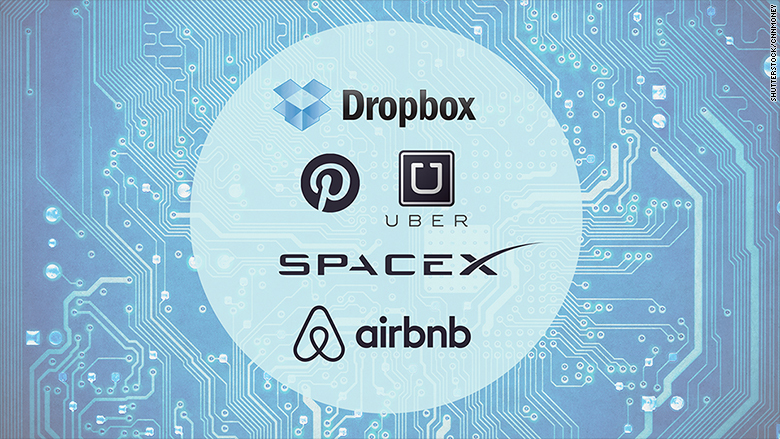 Will these "unicorns" tech firms be valued at a combined $200 billion by 2020? One man is betting $100,000 that there is -- in fact -- a tech bubble. But he's hardly an adamant bubble theorist. Many in the industry have been sounding warning bells about a possible bubble, citing early-stage startups attracting millions in investment at sky-high valuations, despite having little or no revenue. Last week, tech investor Sam Altman challenged bubble believers to put money where their mouths are. Altman, who invests in young tech companies through Y Combinator, said that though there are some unreasonable valuations, he's hopeful about the future of tech. He made three predictions on where specific tech startups will be in five years' time and encouraged someone to bet against him. The wager: $100,000 in a charitable donation. These six "unicorns" (companies valued at over $1 billion) -- Uber, Palantir, Airbnb, Dropbox, Pinterest, and SpaceX -- will be worth a combined $200 billion by January 1, 2020. That's double what they're worth today, according to Altman. Nine mid-level Y Combinator startups -- including payments startup Stripe and bitcoin exchange firm Coinbase -- will be worth a combined $27 billion (up from less than $9 billion currently). Y Combinator's current batch of 114 startups ("currently worth something that rounds down to $0") will be worth $3 billion by 2020. Interestingly, de la Maza -- who runs a $500,000 fund -- doesn't have strong beliefs on whether we are, or are not, in the midst of a tech bubble. "People call it a bubble whenever valuations are 50% higher than they were a year ago. I think that is very uninteresting," he said. "[It is] a very information light conversation." De la Maza said he took the bet because he wanted the opportunity to work with the startup guru -- and he believes in Altman's mission. "I'm relatively indifferent to what the bet itself is," de la Maza said. "I think what [Altman] was trying to do was turn [the bubble] into a hypothesis that can be tracked -- to make it very clear, and allow people to concretely talk about." Altman confirmed the bet on Sunday via Twitter. He also opened up the bet to another investor with a larger portfolio. Danielle Morrill, CEO of Y Combinator-backed Mattermark, will track the startup portfolios in question using her firm's business intelligence software. De la Maza , who used to play chess and poker, said he's prepared to donate to charity should he lose the bet. He's even eying a Y Combinator-backed nonprofit as a potential recipient: Watsi, a crowd-sourced healthcare platform. "I think it's a wonderful thing that a charity is going to receive $100,000," he said.